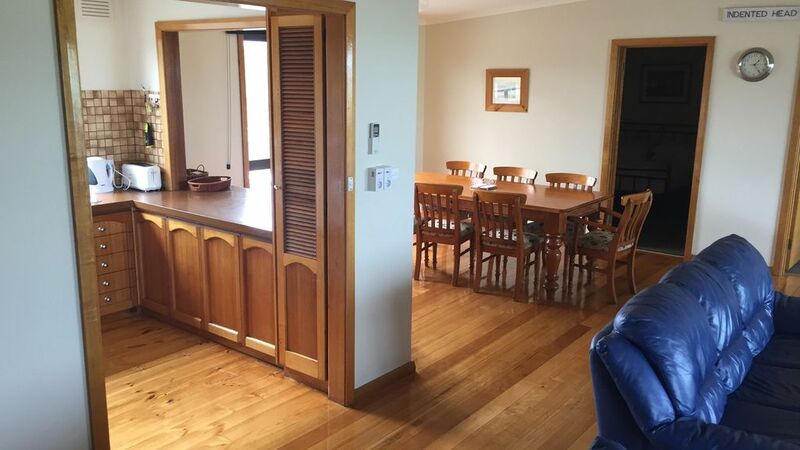 2 storey beach house with 4 bedrooms, sleeps 10 comfortably. Separate living areas, bathroom and toilet on each floor. Polished floorboards in all living areas and breathtaking views of the bay and Melbourne city skyline from first floor balcony. Quality air conditioning and heating for all year comfort. Fully equipped laundry and kitchen includes microwave and dishwasher. Large TV and DVD in both living areas. BBQ and outdoor furniture to provide the finest mix of indoor and outdoor accommodation. Additional fridge and kitchenette in downstairs living area. Ideal for the larger family or families to share. Secure off street parking for both cars and boat, and plenty of back yard room for summer fun. BYO linen (doonas, pillows and additional blankets provided). What a perfect place for a few families to stay! It had everything we needed, especially the ‘kids zone’ down stairs! They only came up to eat! Fabulous location to the beach in a picturesque town. Great house & location. Clean & tidy with everything we needed for an enjoyable stay. Comfortable beds. Lots of space. Would definitely hire it again. Great space for big family groups too. The house was spacious, clean and had everything that was needed th have a good holiday, also the owners were great and friendly. I would recommend this house to anyone looking for a great place to stay. This is a great house with a lot of room for the family. The beach is a close walk but I would suggest you take bikes. We did and really enjoyed the track to St Leonards or Portarlington. The house had everything we needed and was close to other beaches, wineries and Geelong. Overall, a great place to stay.